The Earth – it’s a beautiful blue ball of life, and it’s our responsibility to keep it that way. One of the biggest parts of going green is conservation, and your finances are another valuable resource you’re probably trying to conserve as much as possible. What better way to celebrate this beautiful place we call home than by saving some green in more ways than one? Check out these 6 ways to celebrate for less than $15 this Earth Day and keep the world and your wallet a little bit greener. Wherever you find yourself this Earth Day, there are bound to be clean-up efforts going on near you. These are free events that are usually open to volunteers, and they’re a great way to connect with other eco-warriors in your area. 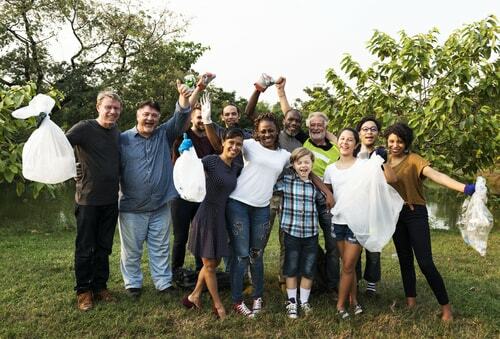 Check out your local event calendar for park or roadside clean-up events – you probably have a perfect pair of gloves at home already, and you can help make your community a little cleaner and greener one piece of trash at a time. Reducing your carbon footprint by driving less and making more eco-conscious decisions is the first step toward going green. Our vehicles require expensive gasoline to run, which ends up costing both us and the environment dearly. Driving less can really help cut down on harmful vehicle emissions, and carpooling is a great way to reduce your overall fuel consumption, saving you and your “poolmates” a little extra green, too. Buying organic produce at your local farmer’s market might cost you a little extra each shopping trip, but you can’t put a price on the health and well-being of your family. Local organic growers don’t need big delivery trucks or travel great distances to get their produce to you, and they tend to steer clear of any excessive packaging. And you don’t even need to do something drastic like take out a car title loan to make these lifestyle changes - there are other easy, set-it-and-forget-it ways to reduce your environmental impact for less. Many low-flow shower heads can be found online for less than $20, and although energy-efficient LED light bulbs can run you a little more, they pay for themselves many times over. Get reusable alternatives whenever possible. Make your to-go cups reusable hard plastic instead of using styrofoam. Bring your own reusable bags or basket from home when it comes to groceries so fewer plastic bags end up in our landfills. Rechargeable batteries can also save you more and more money with each charge, saving you money and reducing your carbon footprint. And if you’re really all about that re-using life, you can kick it up a notch by recycling your food waste and making your own compost to use in your own herb and vegetable garden. Living more cost-effectively can really add up to big savings, and you’re reducing your impact on the environment with every new way you find to go green. If you’re not recycling already, why not start today? Buying recycled goods and recycling yourself are two simple ways we can do our part for the environment. You can even involve your children by using it as an opportunity to teach the next generation to be a more mindful consumer. And if your office or workplace doesn’t recycle, maybe they could also benefit from going green. A green initiative will not only save your company a lot of money, but also reflect positively on your company for caring about our planet. It might even make you look like a Planeteer in the process. If you’re serious about living a greener lifestyle, the best way to do it is to plant something green. 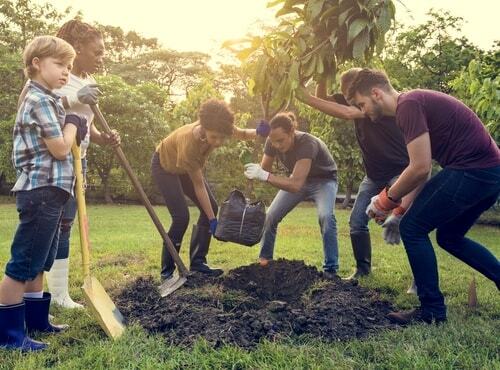 From planting your own fruits and vegetables to volunteering at a tree-planting, there are lots of ways to incorporate nature itself into your Earth Day celebrations. Attending a tree-planting is generally free and is a great way to engage with your community. Starting your own herb garden can help you save big, considering how much you pay for fresh herbs at the grocery store or farmer’s market. Just imagine how much you could save, and how beautiful your garden could be this summer. Switching to more eco-friendly alternatives can really help reduce your impact without changing your lifestyle. Household cleaners are a big way you can make a difference. Using natural cleaners, or even better, making your own with white vinegar and baking soda, is cheaper and not harmful to the planet. You can also try looking for cruelty-free make up and other products for guilt-free self-care. E-readers are also great for going green. If you have one already, digital copies of books can save you a pretty penny while saving some trees. Even if you don’t own an e-reader, getting an Audible subscription can help you bridge the device gap – listen to all your favorites in the car or on your phone and turn your free time into reading time for a small monthly subscription. If you’re an avid reader, this could even help you save on your book habit. Looking for more ways to get involved and make your community a better place? Use the internet to create awareness and organize a project that’s meaningful to you this Earth Day. Facebook is a perfect place to start the conversation or join one. Whether you’re attending someone else’s Earth Day event or organizing one of your own, the best way to make a difference this Earth Day is to create awareness and participate in the eco-effort. Planet Earth is our home, and unless we terraform and colonize Mars, it’s the only one we’ve got. 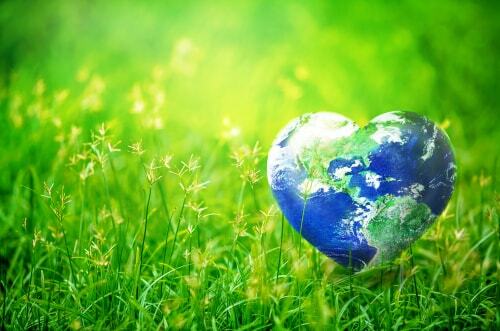 Remember to treat Mother Earth right this April 22nd and follow these easy tips. Then, make sure to tag pictures and posts with #EarthDay to let others know how you and your fellow Planeteers are doing your part to make the Earth a better place. Awareness is half the battle, so this year, show yourself just how much your efforts can do to help and lead others. Remember – the power is yours.